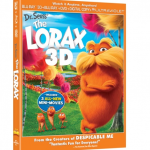 I didn’t get a chance to see Dr. Suess’ The Lorax when it was in theaters, so I can’t wait until August 7th when it releases on 3D Blu-ray and Blu-ray Combo Pack. I know it’s still two months away, but check out this brand new trailer with a look at at the mini-movies bonus features. Serenade – Two Bar-ba-loots — one love shy and the other suave and confident — battle for the heart of their would-be sweetheart with the help of a colorful cast of characters, including the Humming-Fish and Swomme-Swans. Wagon-Ho – Two Bar-ba-loots take The Once-ler’s wagon on a ride they won’t soon forget. Forces of Nature – Determined to scare The Once-ler out of Truffula Valley, The Lorax decides to create the illusion of ominous forces of nature.